The 4th edition of the fair showcased 40 Galleries, presenting the works of 130 African and African diasporan artists. 1:54 truly recognises and communicates the huge diversity of practices and work being produced across the African countries and its diaspora. In fact, this diversity is a fundamental characteristic of these places and the perspectives and insights that accompany them. 1:54 challenges the misconceived notion of ‘African Art’ as a single visual entity, as opposed to a collection of 54 counties, each with its own distinctive characteristics. A significant aspect of this exhilarating fair is that not only does it bring together emerging artists with those more established but it also showcases a variety of both male and female artists’ works with a balanced approach. Running concurrently to the mammoth Frieze Fairs, that celebrate “greatness” an idea that is predominantly defined as white, Western and male, it is a pleasant surprise to see such unity and equality at 1:54 African Contemporary Art Fair. 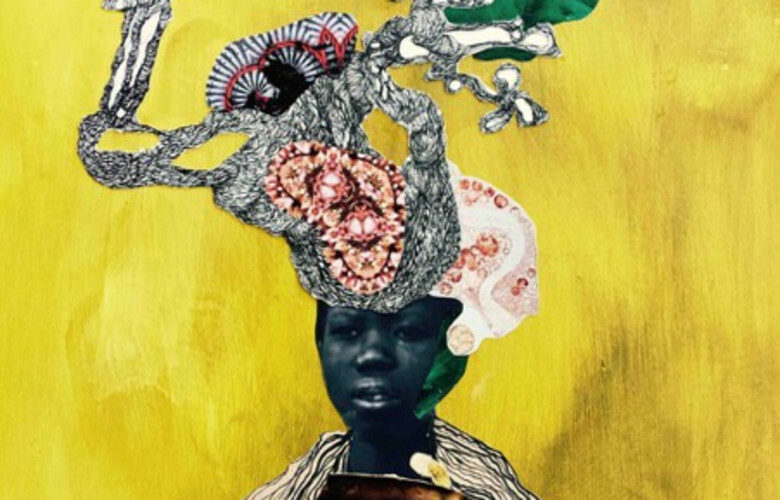 Afronova, a Johannesburg-based gallery, made a particularly exciting move, presenting the work of five young female artists. Lebohang Kganye’s photographic series, Ke Lefa Laka is especially memorable, the artist layering images of herself onto old photographs of her mother. Another fair highlight was the collaboration between Somerset House and MAGNIN-A-Gallery, presenting the late photographer, Malick Sidibé’s, first major solo exhibition in the UK. Sidibé’s who passed away in April this year is known for his black-and-white photographic works chronicling the lives and culture, in his native Bamako, Mali in the 1950s, ‘60s, and ‘70s. The show includes 45 original prints from the 1960s and 1970s around three defined themes: ‘Au Fleuve Niger / Beside the Niger River’, ‘Tiep à Bamako / Nightlife in Bamako’, and ‘Le Studio / The Studio’. The exhibition “The Eye Of Modern Mali” launched at 1:54 and Sidibé’s works will continue to be shown throughout Somerset House’s winter season (ending on 17th January 2017). The fair is accompanied by the educational and artistic program, FORUM, curated by Koyo Kouoh and will include lectures, film screenings and discussions, providing a liberating space for conversation and exploration. FORUM London 2016 aims to demonstrate the influence and confluence of African perspectives in contemporary art and design with that of diverse aesthetics and material practices around the world. Africa is a vast and diverse continent and despite the extensive political instabilities, the cultural growth is undeniable. Amid strong demand and rising prices, contemporary African art is increasingly attracting the attention of investors worldwide. This is easily observed at 1:54, which attracts a high caliber of clients and collectors. The fair delivers a slick and bold presentation of African Art. The work is charged with political and social undercurrent, but also shows humor allows the viewer a deep insight in to the fascinating culture and history of Africa.